Globally, Earth's air contains almost 13 trillion tons of water, a vast renewable reservoir of clean drinking water. Trials of many materials and devices developed to tap this water source have shown each to be either too inefficient, expensive or complex for practical use. A prototype device developed by Peng Wang from the Water Desalination and Reuse Center and his team could finally change that. At the heart of the device is the cheap, stable, nontoxic salt, calcium chloride. 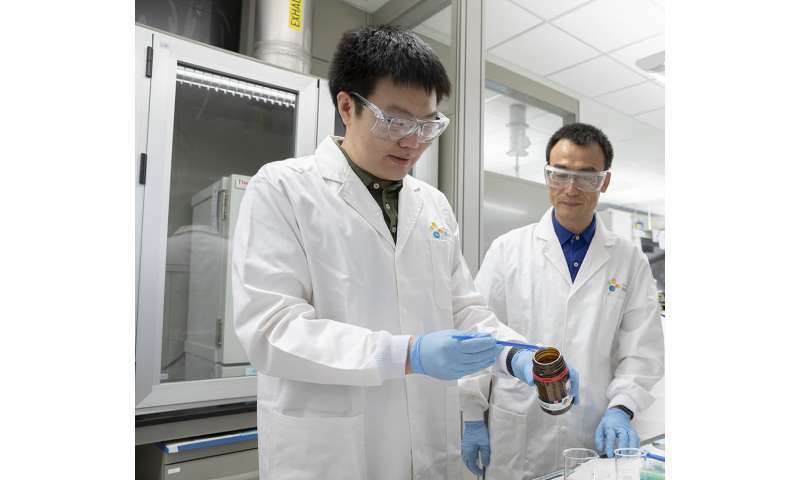 This deliquescent salt has such a high affinity for water that it will absorb so much vapor from the surrounding air that eventually a pool of liquid forms, says Renyuan Li, a Ph.D. student in Wang's team. "The deliquescent salt can dissolve itself by absorbing moisture from air," he says. Calcium chloride has great water-harvesting potential, but the fact it turns from a solid to a salty liquid after absorbing water has been a major hurdle for its use as a water capture device, says Li. "Systems that use liquid sorbents are very complicated," he says. To overcome the problem, the researchers incorporated the salt into a polymer called a hydrogel, which can hold a large volume of water while remaining a solid. 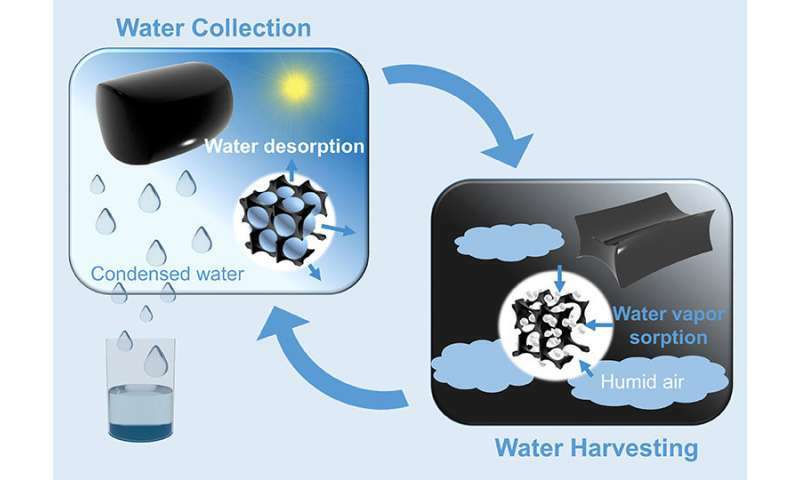 They also added a small amount of carbon nanotubes, 0.42 percent by weight, to ensure the captured water vapor could be released. Carbon nanotubes very efficiently absorb sunlight and convert the captured energy into heat. "The hydrogel's most notable aspects are its high performance and low cost," says Li. If the prototype were scaled up to produce 3 liters of water per day—the minimum water requirement for an adult—the material cost of the adsorbent hydrogel would be as low as half a cent per day.